St Charles was born the third son of six children into a very wealthy aristocratic family in Lombardy, Italy. At 12, St Charles formally committed himself to following a religious life while at the same time his uncle bequeathed to him the future income from one of his Abbey’s. St Charles accepted the income but took only what he needed for his education and a basic lifestyle, the remainder he diverted to the poor. 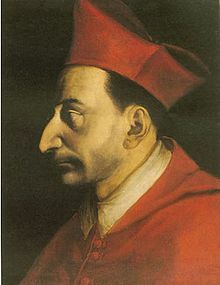 St Charles studied law at Pavia University and in 1560, aged 22, he was appointed Cardinal by his then uncle, Pope Pius IV. Four years later he was appointed Archbishop of Milan. St Charles was a great reformer within the Church, reinforcing lapsed practices and founding new and reformed seminaries and other institutions. During the 1576 Milan famine, instead of fleeing the city with the many other city leaders, he stayed to help feed 60-70,000 people daily, using what little was available and incurring great Church debt. St Charles’ advice was often sought by many, from Popes to sovereign rulers. He died aged just 46yrs. He is venerated as a Saint of students and the arts. His Feast Day is the 4th November. your life through Jesus Christ your Son in the Holy Spirit.